Jamie: Today's color is China Glaze Ruby Pumps. This is a classic and a coveted color from China Glaze. It was originally released with the limited-edition Wizard of Ooh Ahz collection back in 2001, and, after fans clambered for its re-release, China Glaze listened and put out the collection again in 2009. Ruby Pumps is just one of those colors that works its way into every girl's heart -- it's a perfect, gorgeous cherry red with tons of sparkle and a jelly finish. And, obviously, it's meant to emulate Dorothy's ruby slippers, which I think it does in spades. In short? It's perfect. And this is coming from someone who doesn't even wear red nail polish! China Glaze Ruby Pumps retails for $6.50 at drugstore.com. Katie: Today's color is Zoya Adina. Duochromes are all the rage these days, but when Adina was released in 2010, they were much less common. 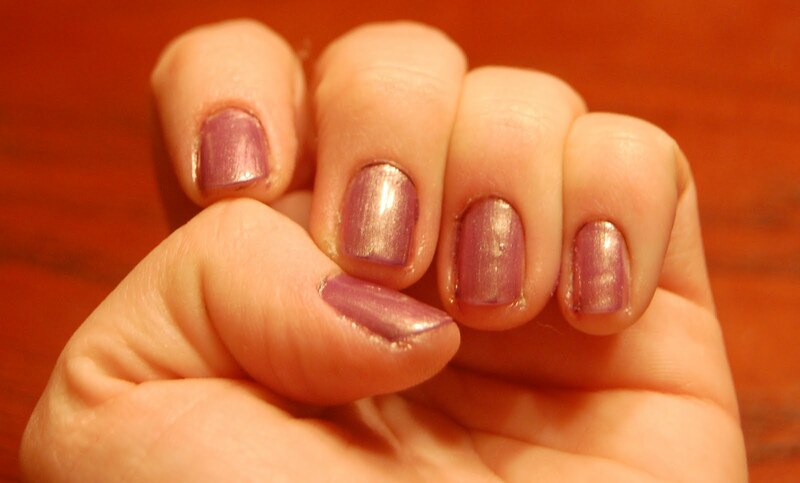 Zoya Adina is a really fun purple-based polish with a green shimmer in certain lights. I could stare at my nails all day long when wearing this, and I particularly like the combination of purple and green. It's shown here with three coats. Two might be enough for some, but I didn't totally get rid of the nail line until I added a third coat. Zoya Adina retails for $8 at zoya.com.